One man from 5 Column, a Pte. Pierce, had the good fortune of finding his way back to his unit, not once, but twice during Operation Longcloth after being lost overnight on both occasions. 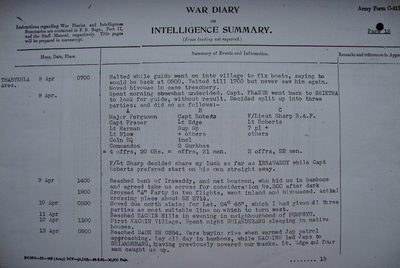 His exploits are mentioned in Bernard Fergusson's book about 5 Column's adventures in 1943, Beyond the Chindwin. We know that Pte. 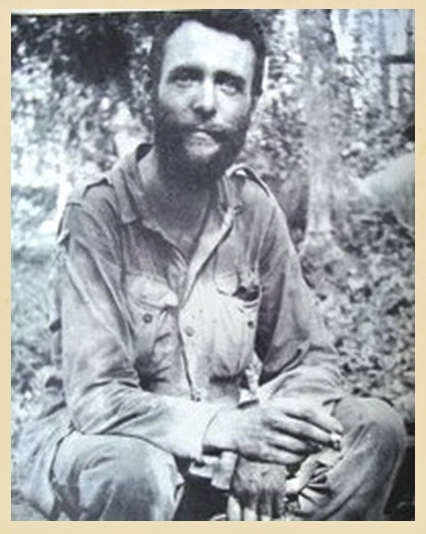 Pierce returned safely to India that year, but the lack of any other details about him, his christian name or Army number for instance, means that we cannot fully identify this man or his pathway to becoming a Chindit. ​At the time of 5 Column's dispersal, Pte. Pierce was placed into the group to be led by Captain Tommy Roberts. 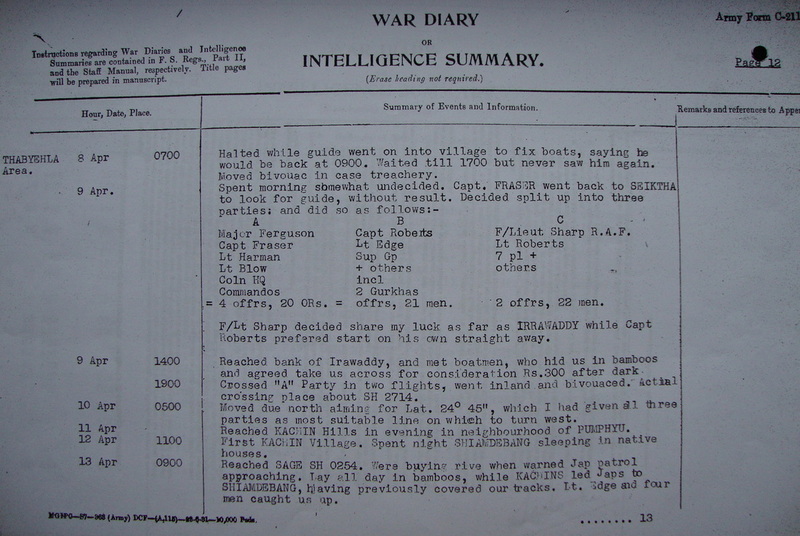 It was at this point, around the 10th April 1943, that Pierce became lost to his comrades for the second time in just under ten days. It seems that he had left his precious water bottle behind at the last column halt and asked permission to return to the location to find it. He never managed to re-join Roberts' group again. We had broken down into three dispersal groups close to the Irrawaddy. Tommy Roberts had seen an old fishing boat on the back of the mere behind the fisherman's hut, and near it an old bullock-cart. He proposed to put the one on the other, and wheel it to the Irrawaddy. Denny Sharp wanted to come with me as far as the river, and share my luck there if I had any. I proposed to march boldly to the river in daylight, straight away, to see if there were any sign of boats. NB. All Chindit columns had a messenger dog. Judy worked with 5 Column under her two original handlers, Pte. 3779341 William Henry Anders and Pte. 5116413 Harold Victor Cummings. Sadly, both these men perished as a result of their time on Operation Longcloth. 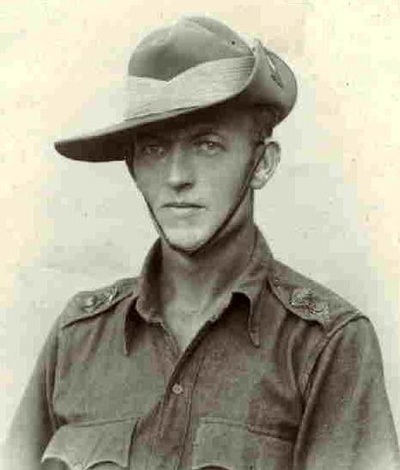 William Anders was captured at the Shweli River on 1st April 1943 and died in Block 6 of Rangoon Jail on the 14th March 1944. Harold Cummings was lost somewhere on the Chinese Borders in late April 1943, having dispersed with Lieutenant Musgrave-Wood of 7 Column. I am pleased to report that Judy did make it back to India as part of the dispersal group led by Flight-Lieutenant Denny Sharp. The other incident has often been publicised by journalists and others, but as it happened to us I claim the right to repeat it. We suddenly heard the unmistakable sound of a British soldier whistling, and out of the jungle emerged the jaunty figure of Private Pierce. 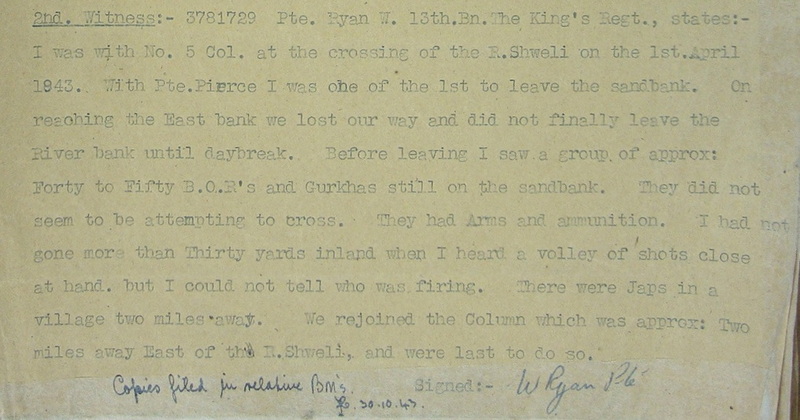 Private Pierce had been one of the two men who changed his mind about remaining on the Shweli sandbank on the 1st April, and had caught us up after we left. Now, allotted to Tommy Roberts' party, he had left his water bottle behind at the fisherman's hut, and had gone back a few hundred yards to retrieve it. 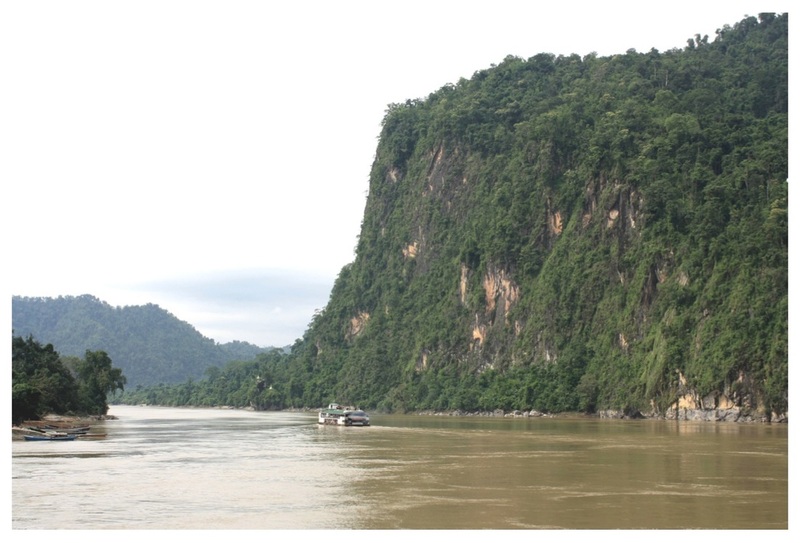 Having done so, he had failed to find Tommy again; but, knowing the intention was to cross the Irrawaddy, he had walked in broad daylight to the riverbank, and then along it until he found a man with a boat. This chap invited him to supper which, having no previous engagement, he accepted; and was then put across the river. All directions were much the same to him, so he decided to make for the fire which I had been at such pains to avoid. Here he found another fisherman, who also invited him, not only to supper, but to spend the night. This also he accepted, and left next morning at dawn with his pack and pockets full of dried fish, tobacco and chantaga; plus a cooking-pot and a neat knitted bag to carry it in. I feel there must be a moral to this story, but I cannot think what it is. But, as I said at the time, with luck like Private Pierce's no wonder he was whistling. The Irrawaddy River at the second defile. This was the general location of 5 Column's dispersal and crossing point on 10th April 1943. As mentioned by Bernard Fergusson, Pte. 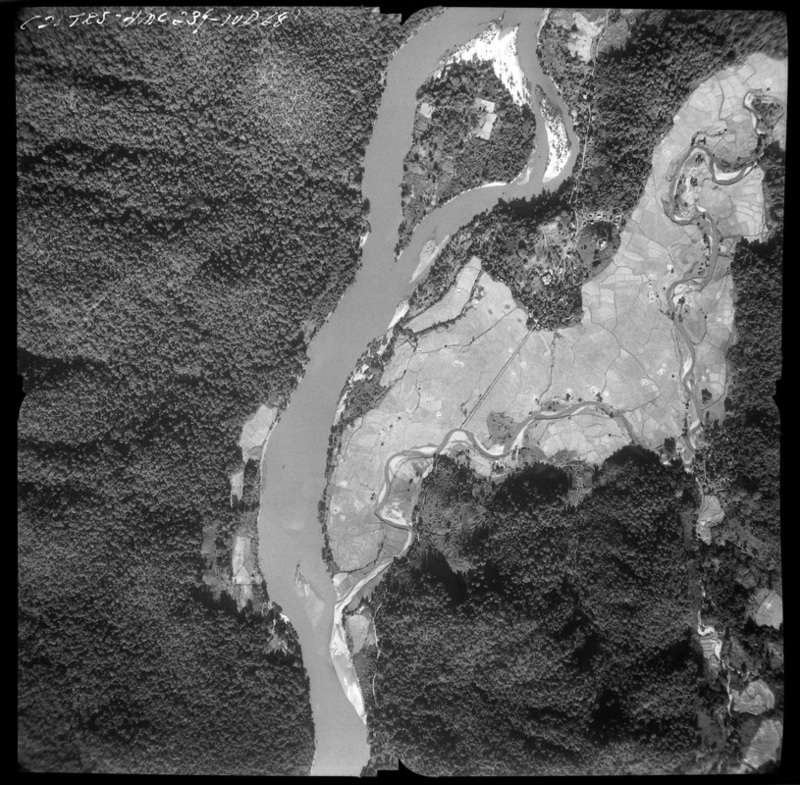 Pierce had almost given up the chance of escaping Burma around ten days earlier, when he was one of the fifty or so men who refused to cross the last section of the fast flowing and treacherous Shweli River. On the 1st April near the village of Tokkin, 5 Column had managed to reach what they thought was the far bank of the Shweli, but discovered to their horror that they were actually on a large sandbank in the middle of the river, with still some 80 yards of rapidly moving water between them and their ultimate goal. Already exhausted and malnourished, this proved too much for some of the men and they slumped down on to the sands to rest. Fergusson and his officers urged the men to rise up and attempt the final crossing, as, by this time a Japanese patrol had closed in on the now desperate Chindits. 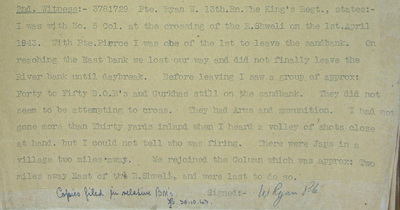 A section of Burma Riflemen decide to attempt the crossing, but two were quickly swept away by the foaming waters, this was the final straw for the other men and they refused to carry on. Pte. Pierce, Pte. Ryan and around eighty other men from 5 Column re-crossed the Chindwin River on or about the 24th April 1943. Seen below is a Gallery of images in relation to this story, please click on any image to bring it forward on the page. Copyright © Steve Fogden, June 2016.